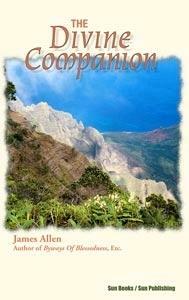 THE DIVINE COMPANION by James Allen Truth as Awakener, Truth as Protector, Of Discipline and Purification, Of Purity of Heart, The First Prophecy-- Called Awakening, The Fifth Prophecy-- Called Transition, The Second Exhortation-- Concerning Humility, Instruction Concerning the Great Reality, Discourse Concerning The Way of Truth, Self-Restraint, Etc. 152 pgs. 5x8. Paperback. ISBN: 0-89540-329-3. $15.00.